Creamy yet healthy; inconspicuous yet bold; seldom do we appreciate all the wonders this modest legume has to offer. As a tribute to this golden gem, the inaugural entry in this blog will be dedicated to it and the star role it plays in the celebrated Middle Eastern dish called hummus. Ask any Middle Easterner and they will insist that hummus originated from their homeland – probably in the heart of some small village, where it was a product of their ancestors’ tears, sweat and toil. To this day, however, no one knows exactly where this highly acclaimed spread originated. With a past that’s ancient history, this heavenly dip lives within the millions of circulating recipes that have adapted through time, culture and local resources. Determined to get as close to an authentic recipe as possible, I went directly to my grandmother. “A few handfuls of chickpeas, some lemon juice, a couple garlic cloves and a tiny bit of tahini,” she said through the proud smile printed on her face. Typical Arab grandmother that she is, it didn’t take more than an enthusiastic expression on my face before she offered to make a batch with me the following day. She had me soak dried chickpeas overnight and woke me up at the crack of dawn to what seemed to be hummus boot camp. I was constantly pulsing the food processor, smashing garlic and squeezing lemons while she gloriously worked her magic to recreate the traditional hummus I grew up eating. After spending the day with my grandmother and experimenting with a few ideas myself, I came up with a hummus trilogy, if you will, that attunes to the palates of purists, classics and hummus eccentrics. 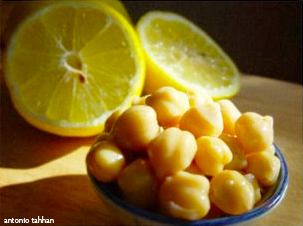 Boil the rinsed chickpeas for 20 minutes in lightly salted water to remove their canned taste and soften them up for processing. Drain the chickpeas and add into a large food processor along with the garlic, lemon juice, olive oil and salt. Pulse until you get that creamy consistency and check for seasoning. Finally, transfer into a bowl and mix in the tahini by hand; cover and chill in the refrigerator until ready to serve. 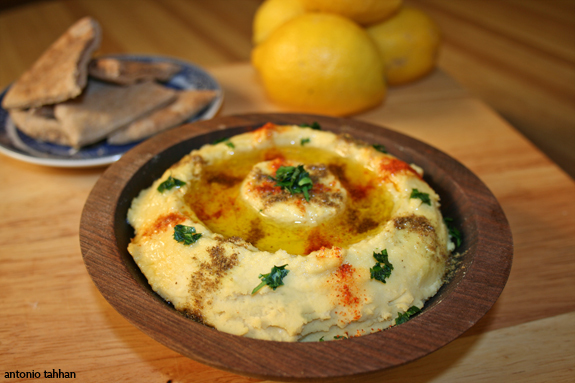 Spread the hummus in a shallow bowl and make a well in the center for the olive oil. For garnish, sprinkle cumin, Hungarian paprika or chopped flat leaf parsley and drizzle your fruitiest extra virgin olive oil into the well. Serve along side some warm pita bread and enjoy!! 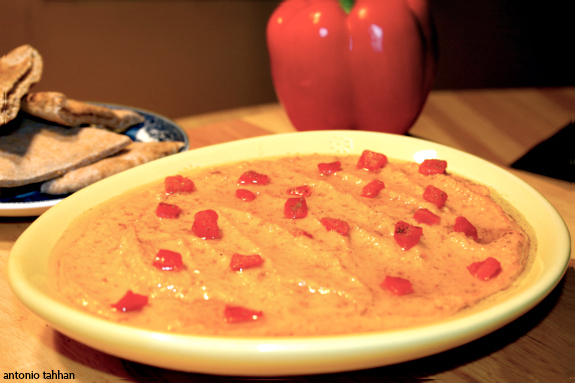 For a classic interpretation of this spread, try my Roasted Red Pepper Hummus. It’s deep flavors and red colors will add sophistaction and vibrance to every bite. Roasted Red Pepper Hummus is a just as easy to put together as the Traditional Hummus. Start out with the same ingredients, but go a bit shy with the lemon juice and olive oil because of the natural moisture in the bell peppers. Pat dry your roasted red peppers and process along with the chickpeas, garlic, lemon juice, olive oil and salt. Finally, transfer into a bowl and mix in the tahini by hand; cover and chill in the refrigerator until ready to serve. Spread the hummus in a shallow bowl and garnish with pieces of roasted red peppers and a drizzle of your favorite extra virgin olive oil. You can serve this with warm pita bread or even as a spread inside a sandwich for a healthy and exotic appeal. 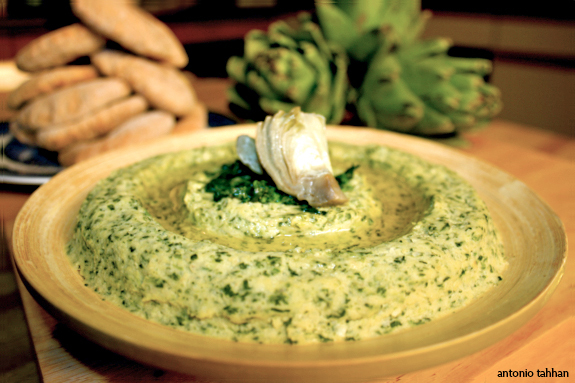 For the hummus aficionados out there, my spinach artichoke hummus is a modern translation of a timeless classic. This recipe came to life after my stubborn self decided to feature a hummus trilogy and was in need of a third recipe. So I drove down to Wegmans with my friend Jason and started brainstorming right down the produce isle, blurting outrageous possibilities like asparagus hummus and even banana hummus. Fortunately, those ideas were immediately vetoed and after many ridiculous suggestions, we stood in front of the wide array of greens. At this point everything fell into place and I looked over at Jason and suggested: Spinach. Artichoke. Hummus. Again, this hummus is just as easy to make. First, defrost the spinach and squeeze out as much of the water as possible. Next, steam (or boil in 1/4 cup of water) the artichokes for 4-5 minutes and then sauté them in olive oil for a couple more. By sautéing the artichoke you cook out most of the water and are left with its natural Mediterranean flavor. Process the drained spinach and sautéed artichokes along with the chickpeas, garlic, lemon juice, olive oil and salt. Finally, transfer into a bowl and mix in the tahini by hand; cover and chill in the refrigerator until ready to serve. Spread the hummus in a shallow bowl and garnish with sautéed artichokes and a drizzle of extra virgin olive oil. Serve this hummus with your favorite pita chips and enjoy! Posted in Middle Eastern, recipe, savory, snack by Antonio Tahhan on September 23rd, 2007. You can follow any responses to this entry through the RSS 2.0 feed. You can leave a response, or trackback from your own site. Hi Tony, can I have the weight of the chickpeas if I’m using the dried instead of canned version? Mrs. Ergül – you’ll want to substitute the two 15.5 oz cans with roughly 1 cup of dried chickpeas. Soak over night and cook in a large pot with a 1/2 tsp of sodium bicarbonate for over an hour. The chickpeas have to be very soft in order for the hummus to be creamy. Don’t stick to the other measurements I have above because it’ll be slightly different – taste as you go along. Also, a good trick for making hummus is to use an immersion blender instead of the food processor (I discovered this after I wrote this post – I need to update it). I hope this helps! Let me know how it turns out.